New Balance's instantly effective response to metatarsal pain! 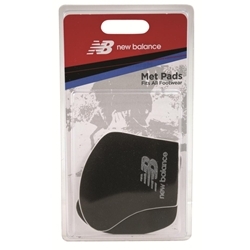 New Balance Metatarsal Pads fit all types of footwear, providing instant metatarsal relief. These Met Pads relieve forefoot pressure and pain, absorb shock, and provide soft cushioning and comfort. They also feature a self-adhesive backing to ensure pads stay in place.